Having these made up for next years rainfurrest, and getting an early jump on it since I can get the glow for no extra charge right now. ;) (Strangely enough met a person at an artist booth who has three designs to sell of pathtags). I used to geocache a lot, and one of the things along with that was a fascination/obsession with collecting these miniature coins called pathtags. These little works of art are the size of a quarter, and are stamped out and then filled with enamel. One side contains your artwork, while the other side has a set pattern on it based off one that the factory has. Every so often they offer specials, such as glow or glitter enamels. 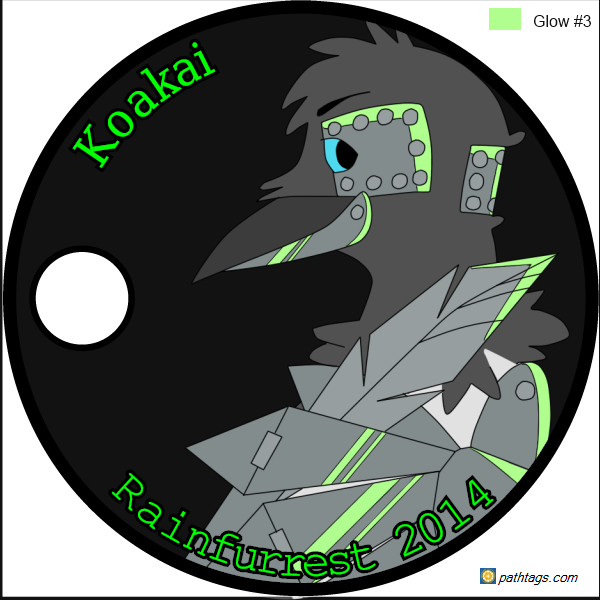 With the cyberpunk theme next year for rainfurrest, I had to get one made up that glowed. Pathtags.com is the site for these cool things. Cool idea, hope the design gets translated okay!